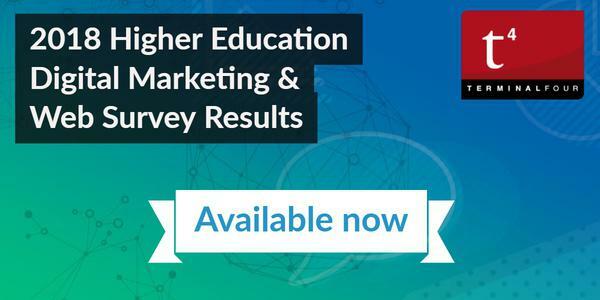 After much anticipation the 2018 Higher Education Digital Marketing and Web survey results are here, and packed with insights guaranteed to ignite conversations, spark debates and inform digital strategies worldwide. This year saw contributions from a staggering 432 Higher Education professionals across the US, UK, Canada and Ireland, Australia, South Africa and 17 other countries and we would like to thank everyone for their input. The full survey provides insights into investment priorities, digital ownership as well as social media use, data privacy and approaches to student engagement, and is well worth a detailed read. For those who are short on time, we've compiled a quick round up of a few of the findings but read on also to get access to the full report below. Increasingly, web and digital experiences are playing a more significant role for students in the selection of a higher education institution. In fact, the survey results indicate that web and social media channels are now the primary way potential students research Universities and Colleges. Students, particularly international students, are often making their final application decisions solely on the quality of information and content available online rather than making a physical visit to institutions. More than ever before, there is clearly a need to supply high quality information and to create a differentiated experience which reflects the personality of institutions in a way which resonates with target audiences. Bringing the campus and student experience to life is now a priority. Taking this further we've correlated the results with publicly available data, and identified a link which shows that Universities and Colleges that do invest significantly in web and digital marketing have better outcomes when it comes to recruiting students. The investment in digital marketing and web still varies considerably from institution to institution and has lots of potential to grow. 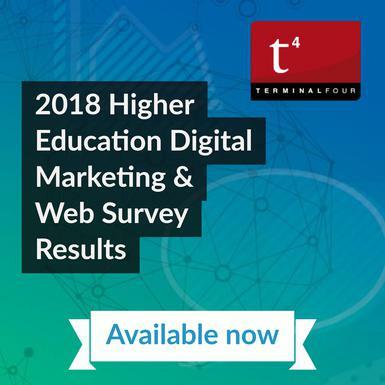 The latest survey findings for instance show that just 22% of global higher education institutions have increased their investment in digital marketing in the last two years (although a fifth have had one-off digital projects signed off this year) and over 13% do not yet have a digital strategy. The survey also highlights a continuing shift in the ownership of web and digital away from IT. For almost two thirds (64%) of higher education institutions the web and digital function is now the responsibility of the communications, marketing and recruitment teams (growing from 26% in 2015). Meanwhile, social media is evolving. And fast. We're witnessing a rapid change in social media use by prospective students, and mirroring this trend, institutions too. The survey found, for example, that although Facebook is extremely prevalent, its ability to engage students and prospective students is perceived as now waning. While 62% reported it to be the top platform for engagement in 2017, that figure slid to 45% this year. Instagram, meanwhile, offers the same targeting potential as Facebook (and conveniently the same advertiser interface) and rose from 20% to 36% compared to last year, making it the fastest growing social media platform in terms of usage by institutions for student recruitment. YouTube is also playing an increasing role in prospective student conversion, while other platforms such as Pinterest and Snapchat which are arguably less well geared to digital advertising are becoming a social media priority for only a handful of institutions (under 4% of those surveyed for Snapchat for instance). Looking ahead, over a third of web, marketing and recruitment professionals expect Instagram to be the social media platform they give the most attention to in the next 12 months. Meanwhile, Facebook's usage for engaging prospective students is set to decline further, with just a third of respondents saying that they would focus their time on Facebook, which is a significant drop from 54% in 2017. Institutions appear to be mirroring the trends seen in their student populations, where there is a shift in usage to more visual platforms which have a more streamlined feature sets like Instagram. You can find the full free report here which covers all this and more, including information on data privacy and GDPR, CRM solutions, approaches to website management, and content personalization. Please share it with your colleagues and contacts and feel free to leave a comment below. We'd love to hear from you.